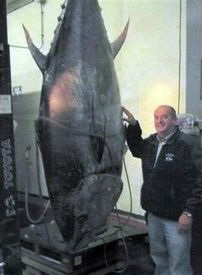 Fishing boat owner Carlos Rafael shows off the 881-pound tuna caught on his trawler out of New Bedford, Mass. New Bedford, MA, fishing boat owner Carlos Rafael was elated recently when one of his bottom trawlers snared an 881-pound tuna. The Standard-Times reports the fish was likely inadvertently snagged as Rafael’s crew was setting its net. A fish that big is hugely valuable — a 754pound tuna sold for nearly $396,000 this year. Rafael drove to Provincetown to meet his crew, but found federal fishery enforcement agents waiting to seize the fish. Rafael had tuna permits, but was told catching a tuna with a net is illegal. The fish will be sold overseas. Rafael will likely get a written warning, and no share of the proceeds if regulators find a violation. A frustrated Rafael will likely give up his tuna permits, saying they’re apparently worthless. California wildlife officials are investigating a complaint that a circus traveling through the state is illegally staging an act involving a boxing kangaroo. The Riverside Press-Enterprise reports that Fish and Game wardens were sent this week to Bakersfield, where the Piccadilly Circus was scheduled to perform two shows. The results of that inquiry were not immediately released. The agency denied the circus a permit to bring kangaroos into the state. Two inspections in Northern California this month did not find any kangaroos. People for the Ethical Treatment of Animals complained that a trainer forces a kangaroo named Rocky to box by agitating the animal. Piccadilly Circus will visit 14 cities in California in November and December, according to its website. The site does not mention a boxing kangaroo. To give out traffic tickets. A cop in Las Vegas, dressed as a big turkey, handed out 64 citations to drivers who did not yield to the big bird. It’s part of the Las Vegas PD’s pedestrian-awareness campaign. Three young British men set a new Guinness record for world’s longest taxi ride. Driving a 19-year-old black London taxi, they covered 32,000 miles, three continents, and 41 countries to reach Australia. With bin Laden taken care of, the folks at Homeland Security must have a lot of time on their hands. To celebrate Thanksgiving, they’ve issued a warning about a new threat to America — turkey fryers. “Use turkey fryers outdoors at a safe distance from buildings,” the DHS [Department of Homeland Security] tweeted. Three shiftless carjackers in Vallejo, Calif., were foiled because the car they targeted had a standard transmission. The three forced the driver out and grabbed the keys, but fled after realizing none of them knew how to work a stick shift. From the San Jose Mercury-News, Boston Herald and New York Post.